I’ve said it before and I’ll say it again: I am addicted to coffee. I like to say I “like” it instead of I “need” it, but who am I kidding? So, yeah. Addicted with a capital I can’t live without it. After my workouts in the morning, I often stop and get a latte for my mid-morning jolt. There is something to be said about sitting down to work with a hot coffee or latte drink. It’s comforting, especially during these cold and wet winter days. But those lattes are expensive! At $3.50 a pop, my morning habit is breaking the bank. So, I could stop buying lattes and force myself into a caffeine-deprived madness, or I could do the next best thing and get a Mr. Coffee Latte. The Mr. Coffee Latte is the newest toy from your favorite coffee maker. It makes lattes for you – at home! You add some coffee and water into the top like a normal coffee maker, and you add your ingredients (milk and flavorings) into the pot. Turn it on and it brews the coffee and froths and warms the milk in just a few minutes. All in the comfort of your kitchen! You can make yourself a latte in your pajamas, with crazy sleepy hair, for pennies. And it’s SO easy. The Mr. Coffee Latte makes 1 or 2 lattes per brew. The pot and the water tank are clearly marked, as to how much water and milk to add – no measuring needed. You simple pour in your ingredients, press start, and walk away. It’s almost too easy. Believe me. I’ve had a latte every single day since I got my Mr. Coffee Latte. I’ve had to buy almond milk just to cut down on the calories. And the variations are endless! 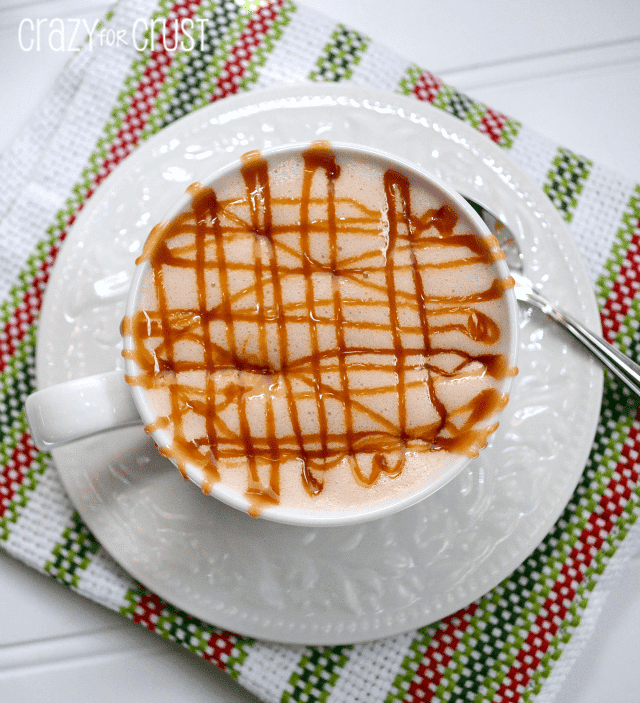 I’ve known I wanted to recreate the popular Salted Caramel drink for some time. Ever since Jocelyn got me addicted introduced me to them, I’ve been itching to try it at home. And it’s SO easy! And gooooood. 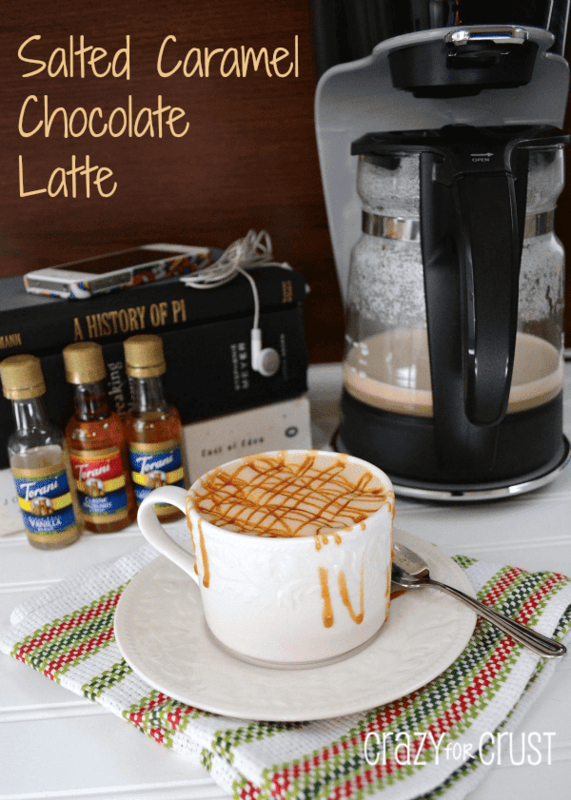 All you do is add some salted caramel sauce to your Mr. Coffee Latte pot, along with some chocolate sauce and vanilla syrup, and you have your favorite coffeehouse drink, recreated at home! I love the skinny drinks you can buy these days – it makes me feel like I’m having a treat…even when I’m being good. The recipe for the Skinny Chocolate Latte that came with my Mr. Coffee Latte tasted so good – and (kind of) guilt free. You know the best part of the Mr. Coffee Latte? You don’t have to brew coffee with it. There is a setting to froth the milk only – no brew. I always have leftover coffee in my pot that’s not quite a full cup. So it’s a perfect way to use that leftover coffee – I froth up my milk ingredients and then just add my coffee to my cup. Or, if you aren’t a coffee drinker, or your kid is sad you’re not stopping for a hot chocolate anymore…you can make your own coffeehouse frothy hot chocolate at home! 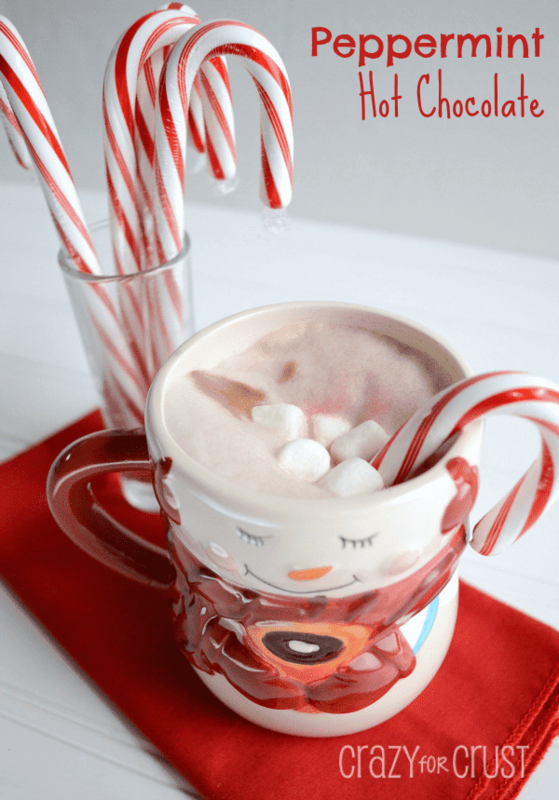 I added a little peppermint extract to make a peppermint hot chocolate, perfect for the holidays! And marshmallows, of course. You don’t get those at the coffeehouse! Jordan loved it, and so did I. This seriously is my new favorite kitchen toy. And I know it will be yours too! 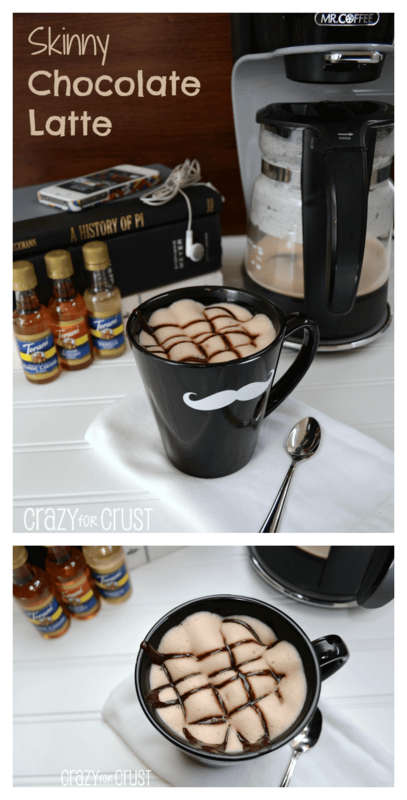 Do you know someone who would love the Mr. Coffee Latte? Are you hoping that Santa will bring you one? Well, I’ve got a great deal for you! Mr. Coffee Latte is offering Crazy for Crust readers a discount on the machine that is going to bring back the brew-at-home movement. You can get $10 off and free shipping on your purchase of the Mr. Coffee Latte at mrcoffeelatte.com by using the code MLAT10A. If you do not have Torani syrup, you can add 1/8 teaspoon of vanilla extract after the cycle has ended. If you do not have a Mr. Coffee Latte, you can heat the Pitcher ingredients in a small saucepan until just before boiling, and then froth in the blender before adding to prepared coffee. Mr. Coffee Latte sent me a free coffee maker and gift pack to try for no charge to me. All opinions are 100% my own. I happen to have a hot pepperminty recipe coming up -tomorrow! Love all the delish looking drinks you made. I could go to town on them all! Wow Dorothy, looks like you’ve been busy with your newest toy. 😉 I can so relate to the morning need for coffee. I’m the same but the only problem for me is, I dislike any type of coffee. No amount of caramel would make me like it but hey, that’s just me. But the giant man-baby, he’s a different story. He loves coffee and often smells like a old school teacher in the morning (remember that old teacher coffee smell?) I’m going to have to bookmark this for later use [read: surprises] when I get a coffee maker and treat him to all of these. He’ll love me forever! What an absolutely fun new toy to play with!! I need one of those in my life like now!! I drink way too many of those coffee shop drinks and my wallet is hurting! In the long run it will save me money so I think my hubby would be all for it:-) Love all the fun drinks you have created for it too. And thanks for the shoutout:-) of course now I really want one and it is too close to bedtime!!! I’m to divorce the Keurig. We’re just not compatible anymore. I think this would make a great present for my parents for Christmas! That coupon and free shipping will certainly help! Thanks for sharing this! Oh and that snowman mug is adorable!